IT WAS clear, from the moment Tom Verlaine and Television wandered nonchalantly from the stage of the Apollo at the conclusion of their remarkable concert in Glasgow ten days ago, that I would soon have to attend a repeat performance by this most extraordinary young American band. 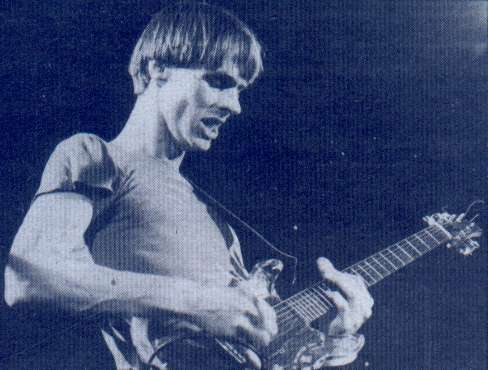 That appearance in Glasgow, as I reported last week, left me in a state of breathless exhaustion, in awe and admiration for Television's collective musical talent and the individual perception and vision of their leader, Tom Verlaine. As I said in the aforementioned review, I was hungry to hear more of the band, though simultaneously apprehensive that I might be somehow disappointed: in Glasgow they had taken me entirely by surprise and I wondered whether familiarity, however tentative, with their approach would blunt the intensity of their attack on a second showing. It took Television only minutes at London's Hammersmith Odeon on Sunday to reconfirm the deliriously exciting impression they had made in Glasgow. As Verlaine and his co-guitarist, Richard Lloyd, rang out those classic, star-spangled chords that so beautifully grace " Venus," my blood froze, just as it had at the earlier concert. Verlaine's vocal here may have veered off course occasionally, but there was no denying the immense majesty of the music. His solo was characteristically eloquent and incisive. I don't mean to underestimate the astute and thrilling contributions of Lloyd (who was in a more subdued mood than at Glasgow, though capable still of delivering solos of cutting virulence), but it is Verlaine who commands one's attention: he's possibly the most distinctive and individual guitarist I've heard since Hendrix. He resorts to no flamboyant pyrotechnics, neither does he rely on any cheap aural or visual effects to enhance his performance. No, like Phil Manzanera, Verlaine concentrates upon a novel and enthralling exploration of the possibilities of his instrument. He's capable of the most sinister delicacy (as on the eerie "Little Johnny Jewel," which featured also a commanding Verlaine vocal and the inspired translation of "Knock-in' On Heaven's Door"); alternatively, his lyricism frequently gives way to Outbursts of the utmost ferocity - as he so powerfully demonstrated on "Elevation," the abrasive reading of "Friction," and the new "Foxhole," which I can barely wait to have on record. Verlaine, to his enduring credit, never allows his versatility, to degenerate into any empty display of shallow virtuosity (Nils Lofgrcn, please note): he is always in command of the situation. Everything he, like Lloyd, plays is considered and precise; there is no gratuitous overkill or aural massacre. "Marquee Moon," with which they concluded, was extended even beyond the length of the original recording (and that weighs in at nine minutes and 58 seconds), yet not once did my attention wander: indeed, such was the intensity of Television's performance that I sat in that theatre completely spellbound as Verlaine spiralled off into the stratosphere, never bereft dilring his lengthy solo of invention or inspiration. With musicians of a lesser calibre to support him on these audacious adventures Verlaine might find himself stranded, but Lloyd, bassist Fred Smith and drummer Billy Ficca all displayed a rare, intuitive sympathy and lucid appreciation of their leader's imagination. All this praise you might dismiss as familiar hyperbole. But I can only insist that you hear Television for yourself before casually dismissing such adulation as the misguided drooling of an infatuated critic. For, I can assure you, this applause is no more than the appreciative recognition of a unique and important new band.